It’s great to work with a vendor you have an established relationship with. But in all aspects of business, there comes a time where you should reexamine the relationship. Some businesses tend to overlook reexamining longstanding relationships. But, you need to make sure your business is getting the same level of quality and value as you were in the beginning. So, having a system in place to track and test the vendor’s performance is essential for your business. Your goal is to understand what value the vendor is actually bringing to your company. So, don’t let price be your main focus. Remember, the lowest price could mean the lowest quality of work. Instead, focus on how your vendors are keeping up with your needs and how they help your productivity. Have our needs changed since the beginning of the contract? Has the vendor met new expectations? Are we satisfied? At what level? Is there something we aren’t satisfied with? 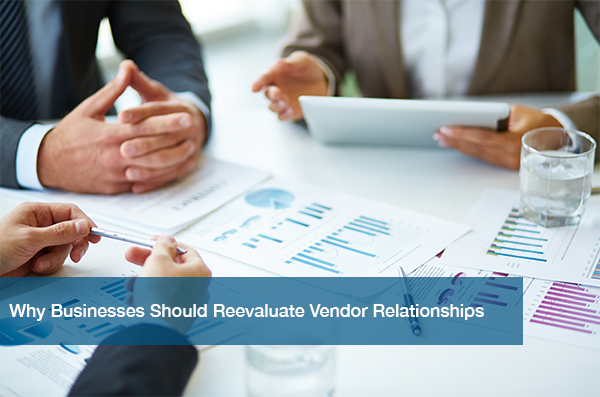 To do what’s best for your business, you should take a second look at your vendor relationships. Below are a few reasons why. A lot can change in a short amount of time. Regardless if you signed a contract 8 years ago or 8 months ago, things in that industry have changed. Reevaluating gives you the chance to see what’s new and expand your options. If your business is looking to save, it’s time to examine your vendors. Compare costs with other businesses who could offer you the same service. Could you be getting more for less elsewhere? This doesn’t mean searching for the cheapest alternative. No matter the cost, with the right vendor, their value could actually increase your bottom line. Exploring your options isn’t going to kill anyone. It doesn’t hurt to have competing vendors show you what they have to offer. If anything, you’re getting a free evaluation of your situation that will only help for down the line. It doesn’t matter what business you’re in, vendors play an important role in your small business’ success. Long vendor relationships are great, as long as they are still benefiting your business. At ITC, we know your time is valuable. We take care of your business’ technology needs so that you’re free to focus on what’s most important – your business. Reevaluate your IT vendor relationship today by scheduling your free IT needs assessment. See what sets us apart and learn what it’s like to work with our team. Together, we can improve the health and security of your computers and network.